Scandinavian outward opening windows have been developed in view of recipients from the Northern Europe where this type of joinery is most popular. Their carefully designed, slim construction gives the impression of simplicity and sublime elegance. The use of high quality materials: (selected glued scantlings, multi-clamp ferrules, heat protection glazing units), and modern production technology allows obtaining a product with excellent aesthetic and functional parameters. 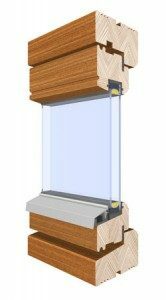 Wood-aluminium windows combine positive features of wood that is naturally beautiful and perfect construction material and aluminium resistant to external conditions. Clever design and appropriate combination of these two different materials give excellent results. 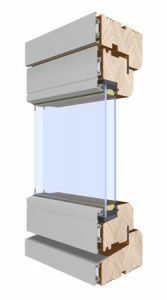 DURWIN windows – nature inside and indestructible aluminium cladding outside. Wood-aluminium windows virtually require no maintenance and are an investment for future generations. They are perfect for buildings that are more exposed to weathering: mountain areas, coastal zones. Single frame, frame dimension 56×92 mm, sash dimension 56 x 61 mm (Durwin) & 56 x 68 mm (Scandinavian) . All technically possible shapes and dimensions. Engineered wood – selected or fingerjointed Pine, meranti or oak timber. The heat transfer coefficient for the window with the test dimensionis Uw -1.3 W / m2K.